Everyone by now knows I love crystals so you can probably imagine that our home has a few of the well known salt lamps. I am a fan of them because I love their glow and that makes me happy. 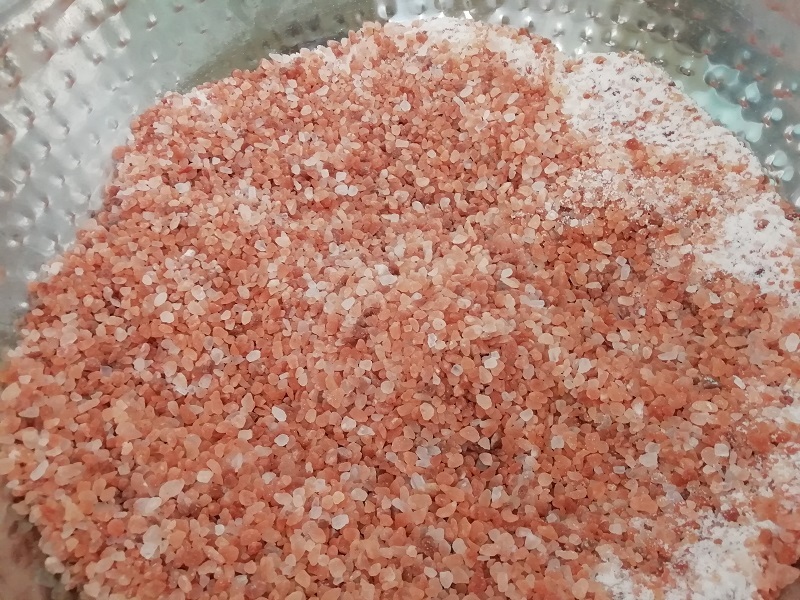 While there is no scientific evidence to support health claims; some of the healing properties of Himalayan Salt include: sinus relief, cleaner air, better sleep, etc. In order to receive those benefits, you need to actually warm the Himalayan Salt. This is why the lamps are so popular in my opinion. 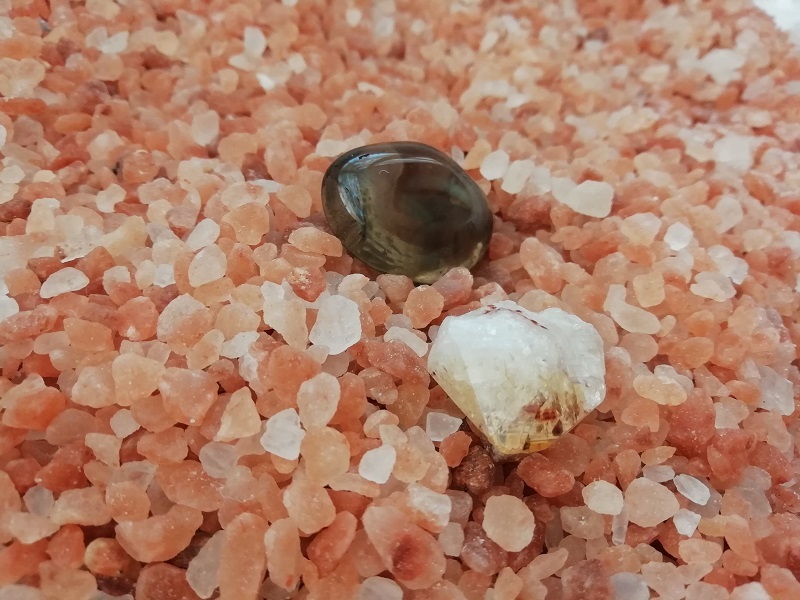 Recently, we’ve been blessed to have a wellness and medical spa open up in Saldanha which boasts a Himalayan Salt Room. They advertise that salt therapy alleviates health problems associated with asthma, sinusitis, allergies and other respiratory illnesses. I’ve been twice and while I cannot say if it helps with respiratory problems, I CAN share my experiences. 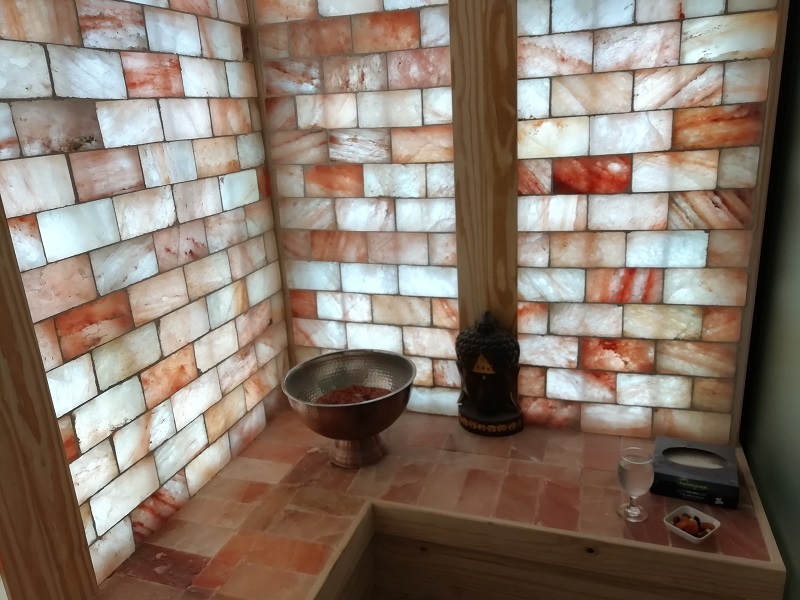 The Himalayan Salt Room is perfect for 1 person or a couple to enjoy together. It has a bench to sit or lie on, along with 3 bowls filled with salt. Two of the bowls have crushed Himalayan Salt that you can use to put your feet in. The other bowl has chunks within. 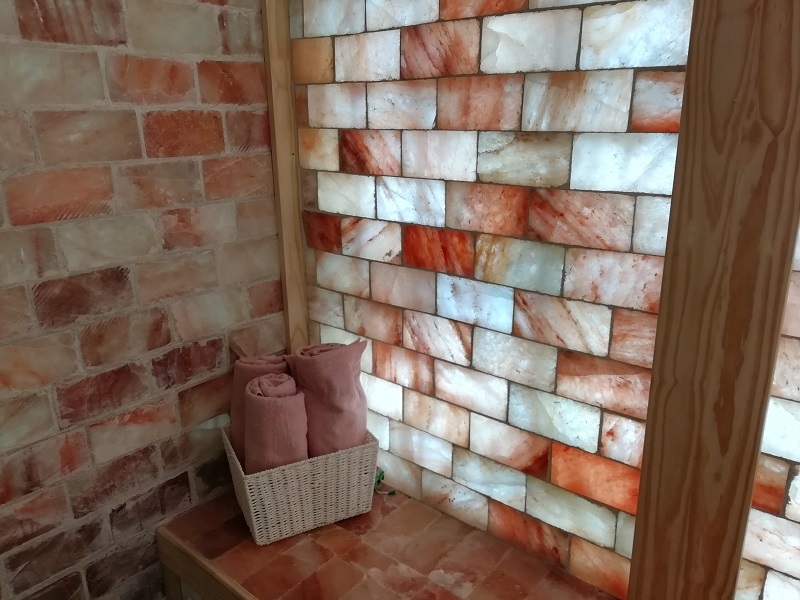 The walls are lined with Himalayan Salt Bricks and the room also pumps out a fine mist of Himalayan Salt into the air. If you weren’t someone who was into the woo woo, you’ll still find yourself enjoying a few moments in the rejuvenating glow of the room. It’s really beautiful and there truly is something about it that’s good for the soul. The first time my husband and I went, I found it incredibly peaceful. It was super relaxing to sit there with Gideon. It’s the perfect addition for a spa day all about relaxation. The second time I went alone. Time in a salt room felt like a good idea to get out and reset; especially since I was feeling stressed, overwhelmed, and all over the show. 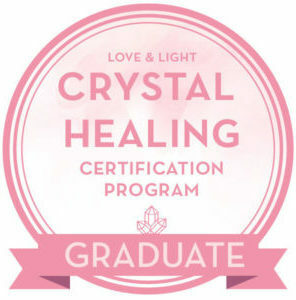 Even though I was unsure about what I was going to do for the 30 minutes, I decided to take crystals with for meditation. Smokey Quartz to flush negativity from my aura and Citrine (heat treated) to boost my mood. 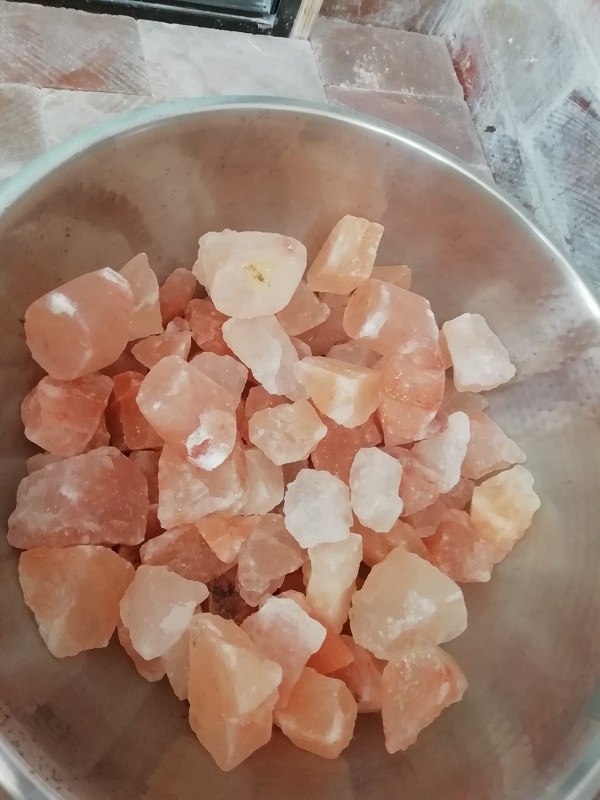 I placed my feet in the bowl of crushed Himalayan Salt along with Smokey Quartz to flush negativity and Citrine on my Solar Plexus to boost my mood. During the time, I meditated while focusing on my breathing to inhale Source/Love energy and exhale negativity/debris. I learnt a good meditation for this in the Elevate your Life Course from Where Hum Rests. You can follow something similar here. The meditation I had in there was incredible. I could’ve fallen asleep if I’m honest and afterwards I felt uplifted, grounded, cleansed and peaceful. 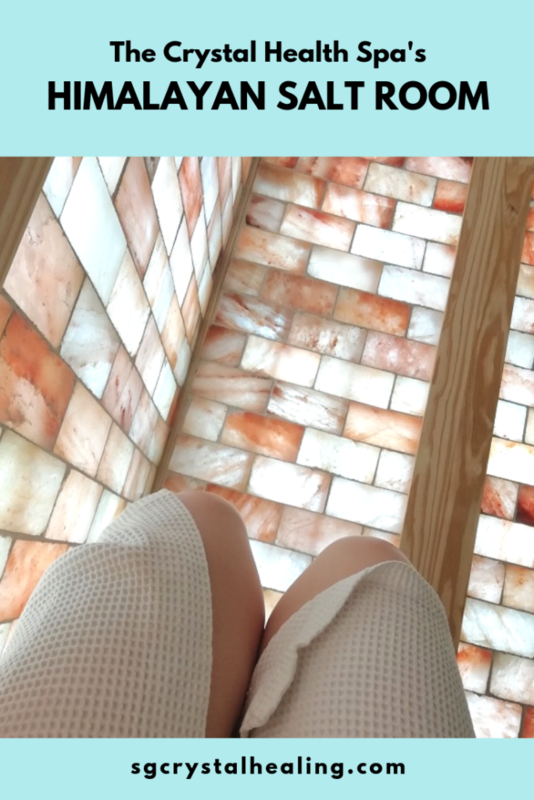 You could enjoy the Salt Room for the “woo woo” reasons, like meditation or relaxation. A salt room’s happy, warming glow would be especially nice during winter when that warmth is limited. Of course, you could also enjoy it for the health benefits too. Many people are already using and choosing Himalayan Salt for its health benefits. If Salt Rooms aren’t your jam, book a massage, mani and pedi or facial. They have a wide range of medical treatments, massage options and beauty treatments available. The staff are incredibly welcoming, friendly and they make you feel comfortable. If you didn’t know what you wanted, chat to them and they’ll help work out a package just for you. Leave a comment below and tell me if you have ever had a session in a Himalayan Salt room. What were your experiences? Does this seem like something you would enjoy?